If you want to make it easier to click and select things in Windows 10, try using the single click option. 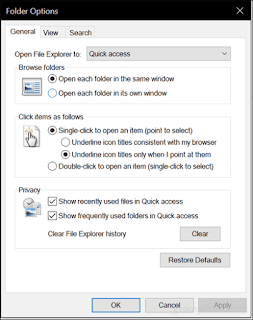 The double-click has long been a convention for launching applications or opening files or folders in Windows. The single click, meanwhile, is used for selecting items. 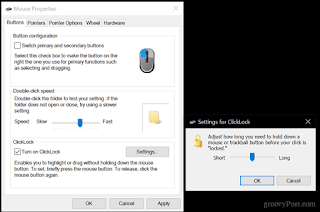 enabling single-click mode in Windows 10 may be useful to you. Select the General tab then choose the radio box Single-click to open an item (point to select). Just like your web browser, you can choose to keep icons underlined like your web browser. I personally prefer maintaining the traditional desktop look. Click Apply then OK to confirm changes. Icons on the desktop and in File Explorer will now display an underline link just like in your web browser when you hover over it. Instead of double-clicking, you can perform a single click to open. Single-click mode will take some getting used to. Try it out—you might like it. But another thing I should point out is the sensitivity of your mouse. If you are prone to accidentally launching things, this can actually make things worse. So, try adjusting your mouse settings in order to avoid making too many unintentional clicks. One function of your mouse that can help with this is ClickLock. ClickLock lets you highlight or perform drag and drop items without holding down the left mouse button. You can enable it by opening Start > Settings > Devices > Mouse, under Related settings, click Additional mouse options. Check the box Turn on ClickLock. You can click settings to adjust how long you want to wait before the selection is made. Depending on the make and model of your computer, the manufacturer might include additional features and functions you can use to personalize your click actions even more. So, check for those in the Additional mouse settings or updates for your device from the vendor’s download page.